Although the housing market continues to show signs of improvement, the overwhelming majority of older homeowners are still expressing a desire to remain in their current homes as they age. As a remodeler, we are seeing an increase in the number of requests to retrofit our clients’ homes to accommodate their changing needs. This is where universal design (UD) comes into play. UD is an architectural practice that allows occupants of all ages and capabilities to live independently and comfortably for a long period of time in the same house. While in the past, the idea of remodeling your home for “aging in place” may have conjured up images of industrial-looking grab bars and wheelchair ramps, today UD elements are designed to be subtle and almost undetectable. Cabinetry is a great place to add UD elements. Pull-out shelves which make cabinet contents more visible and accessible are one popular option. Soft-close drawers and doors also help to protect against pinched fingers. 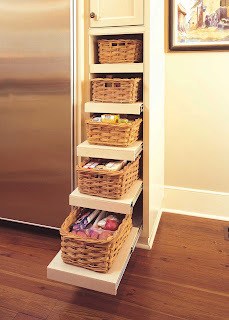 Other accessories like lazy susans, door shelves and flip-down fronts enhance storage capacity as well as accessibility. 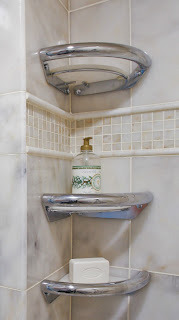 Grab bars are also being integrated into the design of many bathroom fixtures. From faucets and towel bars to shelving and soap dishes, these elegant fixtures provide discreet support, making them both beautiful and functional. Single-lever handles for doors, sinks and showers are easier to manipulate, whether you have an armful of groceries or lack strength for gripping. “D”-shaped handles also make cabinets easier to open. And let’s not forget appliances. Many of the current popular appliance options also deliver UD benefits of better accessibility and increased safety. Wall ovens and warming drawers, French-door style refrigerators and microwave ovens with flip-down doors are just a few examples. Over the past few years, universal design has come a long way, in large part because the products available have become more attractive and flexible. Be sure to talk with your contractor about your needs as you begin the design and product selection process. You have many options for remodeling your space to suit your lifestyle needs both now and in the future while also enhancing the beauty, comfort, convenience and long-term value of your home.